A rowdy group of protesters that included students and professors forcibly toppled the controversial “Silent Sam” war memorial statue at the University of North Carolina, Chapel Hill, on Monday night. The memorial’s destruction came the night before the start of the fall semester and six months after a group of professors pledged to bring down the statue by force after administrators refused to remove the controversial display. 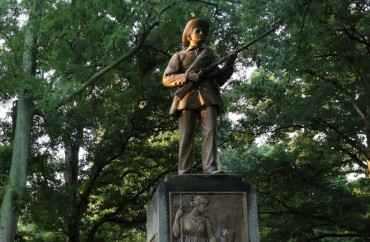 The “Silent Sam” statue, erected in 1913 to memorialize the Chapel Hill students who left college to fight for the South, has long been a target of ire, accused for years of representing white supremacy and institutionalized and current racism on campus. On Monday night, they took matters into their own hands. Various news reports stated that the protestors numbered about 300 and included students, faculty and community activists. There was a heavy police presence and at times tensions between demonstrators and officers. People chanted “stand up, fight back” and “hey, hey, ho, ho, this racist statue has got to go.” During the protest, protesters also hung large banners around the statue and tied them together, blocking it from view. The University of North Carolina-Chapel Hill issued a statement Monday night calling the protest “dangerous,” and added officials will assess the damage.